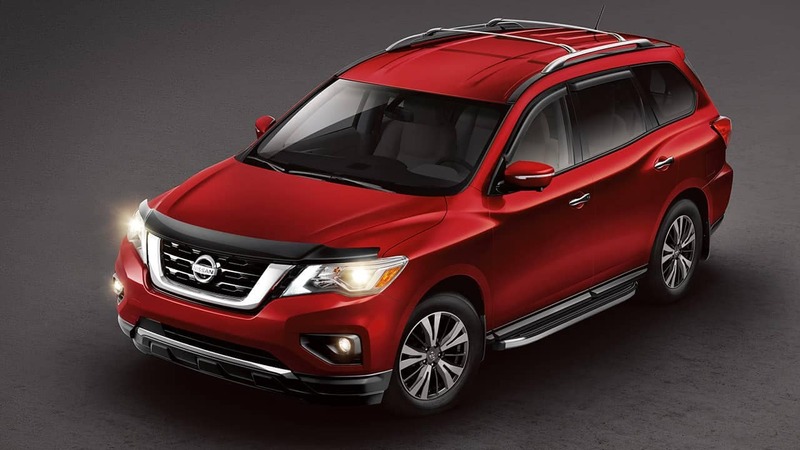 The 2018 Nissan Pathfinder is a versatile seven-passenger SUV that handles with ease. Active safety features and a remarkable V6 engine make the Pathfinder stand out from the rest of the class. To learn more about the 2018 Nissan Pathfinder, keep reading! What changes were made to the 2018 Nissan Pathfinder? Despite having a major remodel in 2017, the 2018 Nissan Pathfinder has many exciting updates for the model year! The Pathfinder adds a unique feature: Innovative Rear Door Alert! This alert system reminds buyers of forgotten items in the rear seats, including groceries, dry cleaning, cargo, pets, valuables, and beyond! Nissan Intelligent Safety Shield Technologies have been expanded, making Automatic Emergency Braking a standard feature of all Pathfinders! This braking technology dramatically lowers the risk and severity of potential frontal collisions, keeping you and all your passengers safe! Finally, the Midnight Edition package is available for SL models, offering impressive content such as a black spoiler, exclusive 20-inch Midnight Edition black aluminum-alloy wheels, black mirror caps, and more. What features are available for the 2018 Nissan Pathfinder? The 2018 Nissan Pathfinder is available in four trim levels: S, SV, SL, and Platinum. S models offer standard equipment such as 18-inch alloy wheels, automatic tri-zone climate control, automatic emergency braking, keyless entry and ignition, roof rails, a rearview camera, Bluetooth, a 6-speaker sound system, an 8-inch touchscreen, satellite radio, HD radio, dual USB ports, a CD player, and two charge-only USB ports for passengers in the rear seats. SV models extend the standard features to include a leather-trimmed steering wheel, rear parking sensors, automatic headlights, foglights, a power driver seat, and an auto-dimming rearview mirror. The SL feature list is extensive and adds navigation, leather upholstery, a 360-degree parking camera system, heated front- and second-row seats, a power passenger seat, upgraded interior trim, a power liftgate, Nissan telematics services, blind-spot monitoring, adaptive cruise control, rear cross-traffic alert, heated side mirrors, and a heated steering wheel. Platinum models further equip 20-inch wheels, ventilated front seats, wood interior trim, a power-adjustable steering wheel, LED headlights, a 13-speaker Bose audio system, a panoramic sunroof, and a trailer hitch receiver. What powertrain options are available for the 2018 Nissan Pathfinder? The 2018 Nissan Pathfinder comes with one exclusive engine option: a 3.5-liter V6. This V6 engine unleashes 284 horsepower and 259 lb-ft of torque. The engine features direct injection technology that adds to both its power and efficiency. Front- and all-wheel are available, and all models are paired with a continuously variable transmission. Fuel economy peaks at 20 miles per gallon in the city and 27 miles per gallon on the highway with front-wheel drive, while all-wheel-drive models achieve 19 miles per gallon in the city and 26 miles per gallon on the highway. When properly equipped, the 2018 Pathfinder has a towing capacity of up to 6,000 pounds. The 2018 Nissan Pathfinder is versatile and spacious, as well as a touch rugged and outdoorsy. With its recent remodel and exciting upgrades, the Pathfinder makes a strong case for itself as a three-row crossover SUV. Contact us today to learn more about what the Pathfinder has to offer and to schedule a test drive!